Alan Dickens says Chris Boyd and the Saints coaches were able to get into some 'nitty gritty' in terms of plans for next season when the Kiwi boss visited the club last week. Boyd will officially take over at Northampton this summer following the conclusion of his commitments with Super Rugby club the Hurricanes. But with the Canes having last weekend off, the 59-year-old was able to jet to England to assess the situation at Saints. Dickens explained: "The players were off last week, the staff were in, Chris Boyd arrived in the country on the Monday and we, as a coaching group, had meetings Tuesday and Wednesday. "Fair play to Chris, he got off the plane and had two-hour meetings with all of us, Gaff (Alan Gaffney), myself, Westy (Dorian West) and Dows (Phil Dowson). "We had really positive conversations on what was his first day and we were in again on the Wednesday for further meetings with Chris. 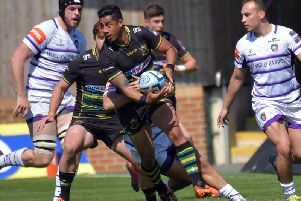 "He then went down to Pennyhill Park (to see Saints skipper Dylan Hartley) and came back on the Friday to meet the team at the top end of the club." Dickens' role at Saints next season remains slightly unclear as Sam Vesty is joining as attack coach this summer. That means Dickens, who held that role before being made interim head coach after Jim Mallinder's departure, will have to switch to a different position in the coaching team. And he believes the coaching structure will become clear in the coming weeks. "It was a fact-finding thing from Chris and to get to know us," said Dickens, who is contracted to Saints until the summer of 2019. "A lot of it was conversation about rugby, we did get into some nitty gritty in terms of attack, defence and players. "A lot of it was pretty relaxed and it was more of a fact-finding mission for Chris. "One of the reasons he came over was to speak about roles and positions will be finalised in the coming weeks. "We're all employed by the club, we're all competitive people and we'll do our best for Northampton Saints. That never changes."